Our January-February 2018 schedule is now available to view, download and print as a PDF file. Our Library Nights continue on the first and third Wednesdays, 6-8 pm, with the exception of Jan 3rd . Open Discussions are on 1/7, 2/4 and 3/4. No programs on the holiday weekends – Martin Luther King Day and Presidents’ Day. To receive emails with our latest postings, please SUBSCRIBE below. Or “like us” on Facebook. 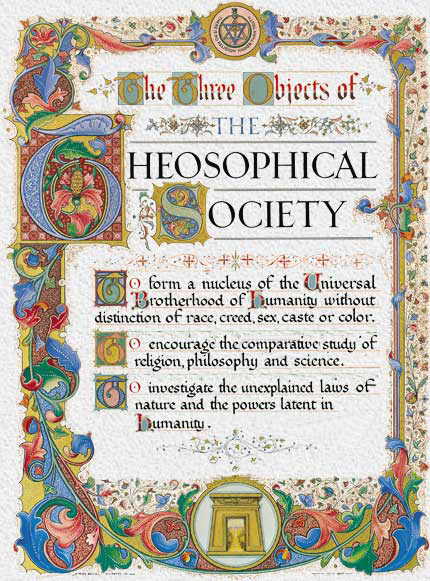 The Theosophical Society is nonsectarian, nonpolitical, and non-dogmatic. No acceptance of particular beliefs or practices is required to join The Theosophical Society. All in sympathy with its three Objects are welcomed as members.